Twenty years ago, a heroic effort led to the construction of Benaroya Hall, transforming the Seattle Symphony and revitalizing downtown Seattle. When Benaroya Hall opened its doors to the world 20 years ago today, it was the crowning achievement of a decades-long effort to move the Seattle Symphony into a permanent home of its own. Constrained by an abbreviated schedule and less than ideal acoustics in its former home, the old Seattle Center Opera House, the orchestra was in desperate need of space to expand. The construction of Benaroya Hall was a heroic effort for an organization that at that time was struggling to balance its finances — and a bold step into its future. Reflecting back 20 years later, the opening of Benaroya Hall was a defining moment for the Symphony, transforming its sound and reputation while anchoring urban renewal in downtown Seattle. Today Benaroya Hall is the most visited performing arts venue in Seattle, welcoming more than 430,000 visitors a year to approximately 400 public and private events each year. In the early 1990s, Seattle was one of only six cities nationwide to have a major symphony, opera company and ballet — and the only city where all three shared the same facility. 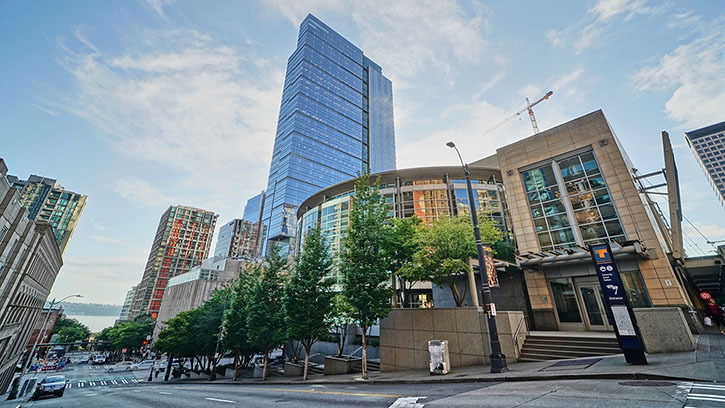 By the time Benaroya Hall opened in 1998, the city was locked into a “cultural gridlock” without adequate space for its performing arts organizations. The Symphony’s previous home, the old Seattle Center Opera House, was booked 360 days a year, making it impossible for the orchestra to expand beyond the a 12-week season. “Besides the scheduling problems, the big issue for me was the acoustics,” recalls Seattle Symphony Music Director and Conductor Laureate Gerard Schwarz. “I felt that for the ultimate growth of this orchestra, and for the artistic health of our city, we needed a hall that was made for the symphony — not a multipurpose hall." When local music critic Melinda Bargreen published an article in The Seattle Times about the need for a new concert hall, it caught the eye of local philanthropists Becky and Jack Benaroya. “Jack and I both felt, without even discussing it, we just knew it was the right thing to do — giving back to the community,” recalls Becky Benaroya. Ultimately, Jack Benaroya called Music Director and Conductor Laureate Gerard Schwarz to arrange a meeting over lunch. The two discussed what it would take to move the Seattle Symphony into a new home and Benaroya made a $15 million contribution to launch the project. With the Benaroya’s lead gift in place, the Symphony went on to raise a total of $118.1 million for the capital project — at the time, the largest cultural capital campaign in the Pacific Northwest. It was an ambitious effort for an organization that was struggling to make ends meet, says Ron Woodard, the Seattle Symphony’s Board Chair at the time. But the project ultimately motivated the community and organization to grow. “It gave us a focus and dream of the future, and during that five years or so that we were raising funds and building the hall we just didn't have conflicts, we had the maestro and we had the board and we had our donors and we had the administration all focused on the same goal, and that was the goal of getting this beautiful facility together,” says Woodard. Local architects Judsen Marquardt and Mark Reddington of LMN Architects were engaged to design the hall with the assistance of acoustical consultant Cyril M. Harris. Through a special executive program at the time, Boeing provided two project managers to oversee construction: Bob Wicklein and Andrew Clapham. On September 12, 1998, the Seattle Symphony celebrated its first Opening Night Concert & Gala at Benaroya Hall. From the moment the orchestra began playing The Star-Spangled Banner, it was apparent to everyone present that the hall was the perfect home for the orchestra. “That first opening night was indescribable,” recalls Becky Benaroya. “And Jack had tears in his eyes, he was a wreck that whole first week. With its new home in downtown Seattle, the Seattle Symphony rapidly transformed its sound and reputation, expanding from a regional orchestra to a world-class ensemble. The first season after the hall opened, the orchestra saw a 50% increase in subscribers, sold-out performances and increased revenue. The Symphony launched an in-house record label, Seattle Symphony Media, in 2014. With an ideal recording environment and control of their releases for the first time, Music Director Ludovic Morlot and the orchestra won their first Grammy in 2015 for John Luther Adams’ Become Desert and another the following year for their recording of French composer Henri Dutilleux’s violin concerto, L’arbre des songes, with violinist Augustin Hadelich. To date, the Seattle Symphony has released over 180 recordings, grown its own record label and won three Grammy Awards and two Emmys. Benaroya Hall is the most visited performing arts venue in Seattle, welcoming more than 430,000 visitors to approximately 400 public and private events each year. In addition to the Seattle Symphony, it has welcomed civic leaders, scientists, artists and comedians from around the world. Nelson Mandela, then-Senator Barack Obama, former Vice President Joe Biden, Ellen DeGeneres, Mike McCready, Chris Cornell and Sir Mix-a-Lot have all appeared on the Arlene A. Wright Stage in the S. Mark Taper Foundation Auditorium. And so too have some of the greatest artists in classical music, including Van Cliburn, Hilary Hahn, Yo-Yo Ma, Itzhak Perlman and orchestras from around the world. Benaroya Hall has also hosted major events and conferences, from the Microsoft Windows 95 team reunion to events for PAX West, the largest gaming convention in the country. In addition to the Seattle Symphony, the hall is the permanent home for dozens of Seattle cultural organizations, including National Geographic Live, Seattle Arts & Lectures, Seattle Men’s Chorus, Seattle Chamber Music Society, Seattle Philharmonic Orchestra, Seattle Youth Symphony Orchestra, Seattle Jazz Repertory Orchestra and the Seattle Classic Guitar Society, to name only a few. Benaroya Hall’s impact extends well beyond Seattle. Each year approximately 10,000 elementary students from across King County and around Puget Sound travel to Benaroya Hall to perform with the Seattle Symphony at Link Up. For many students, it’s not only their first time performing with an orchestra — it’s their first visit to downtown Seattle. Thank you to everyone who made the construction of Benaroya Hall a reality! Through gifts from arts lovers like you, the Seattle Symphony continues to share music with our community. Join our family of donors with your gift today!